Celebrities, families, and everyone in between head to northern California each year to go skiing and to stay at one of the best hotels in Lake Tahoe. It’s a hugely popular sport and Lake Tahoe is a skier’s dream spot to get in some great practice. With Lake Tahoe hotels and resorts in California and Nevada, beginners and children have the option of taking classes so they can learn the adventurous sport. Here is a look at the different locations you and your family can enjoy taking fun skiing lessons at. The Sunnyside Resort and Lodge has been in business on the lake’s western shore since the 1950s and maintains its classic lodge decor, featuring a lobby presided over by a hearth crafted from local stones and surrounded by comfortably rustic pine furniture. Rooms start at $135/night and come with goose-down pillows and comforters to keep you cozy after a day on the slopes. Located right between Lake Tahoe and Reno, Mt. Rose offers their “Rosebud” classes for children’s aged 4 to 10. Children or beginners age 11 and up will get trained on the slopes using three beginner lifts. Your family has the option of taking either private lessons or can learn how to ski with other groups of about six people. The group lessons will run for around 90 minutes and includes equipment rental for the day and a ticket to the beginner ski lift. With its regal name and rooms boasting private balconies and patios, kitchenettes, and even your own fireplace, you would think the Lodge at Kingsburg Crossing was out of reach for the ordinary family. However, a suite for four starts at only $80/night. The Lodge also has a spa for relaxing sore muscles, as well as a sauna, game room, and hot tub. Heavenly is located in the California part of South Lake Tahoe. Adults who are new to skiing can take classes that will allow them to use state-of-the-art equipment. With private lessons it’s recommended that you make reservations in advance. This will secure your spot in the group or private lessons. When heading out to your lesson, you’ll need at least two hours to get outfitted. Purchasing a full day private lesson will get you a slope lift ticket and instructions on how to slide and turn down the slope, and how to stop when you reach the bottom. Not included, however, is a rental for ski equipment. The Blue Jay Lodge is only ten minutes from the lifts at Heavenly, and each room comes with complimentary cable TV, coffee maker, ironing facilities and a free newspaper — all starting at only $31/night! Nothing screams excitement like skiing at the very same location as the 1960 Olympics. California residents and visitors can bring their children ages three and four to the popular Snow Cubs ski program. With the student/teacher ratio at 3-to-1, your kids will be in great hands in their small group. Beginners ages 13 and up will take part in the adult beginner classes. Lessons usually run about two and a half hours long and start around 10 in the morning and 1:30 in the afternoon. Skiing in Tahoe is an adventurous activity that many people like to do together as a family. Even if most of the time is spent taking lessons, you’re doing this together. Even though skiing is one of the most popular sports, it’s important to take lessons before heading out onto the slopes. 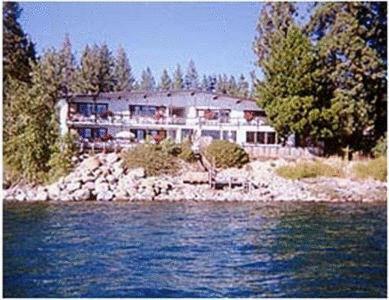 There are many Lake Tahoe hotels for your family to stay at. While it might be a few hours from your house, it’s always best to stay the night in Lake Tahoe and relax in your hotel after a long day of skiing. You’ll be surprised at the amount of energy skiing lessons take. Enjoy a delicious meal and a nice night out in Lake Tahoe with the family. After staying at one of the best hotels in Lake Tahoe, it’s a much less tiresome drive back home in the morning. Tahoe Vistana InnTahoe Vista (California)"Located in the Tahoe National Forest, this Tahoe Vista, California hotel features an outdoor pool and jacuzzi. Guest rooms include a refrigerator, a microwave and coffee facilities." Firelite LodgeTahoe Vista (California)"Located directly across from the sparkling waters of California's Lake Tahoe and offering access to beaches, boat ramps and marinas, this hotel provides guests with comfortable accommodations in an ideal location." Holiday HouseTahoe Vista (California)This quaint hotel in Tahoe Vista is located on Lake Tahoe and is surrounded by the Sierra Mountains. All suites at this hotel have free Wi-Fi and fully equipped kitchens. Holiday House offers barbecue facilities on site for guests.